Welcome to another post on Alberta, the province where I set most of my stories! To check out earlier posts, click here. This week, I'm blogging about fruit and alcohol! A yukaflux is not your friend. Eating fruit that's been sitting in alcohol for a long time is a bad, bad idea. My grand experiment of '96 where I made crabapple liquor should never be repeated. Making apple wine from apples picked in your backyard is a very messy process. Don't the flavors sound yummy? We came away with four bottles. I chose the Black Currant table and dessert wines. My husband chose two table wines: Cherry and Raspberry. I'm looking forward to enjoying them soon...On the Field Stone website, they also have some recipes I may have to try out. ﻿﻿Each of the wines has a distinct and lovely flavor, perhaps in part thanks to their winemaker, Dominic Rivard. 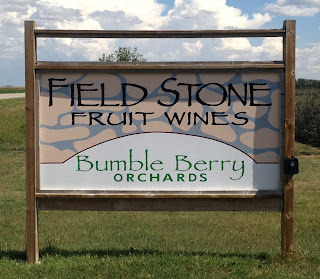 If you want to learn more about fruit wine, he has a blog and has also written the book, The Ultimate Fruit Winemaker's Guide. Hmmm...I have three raspberry bushes...what if? No, no, no! I must remember Items #3 and #4 above! Besides, with three bushes, I'd probably only have enough of a harvest to make one glass. I must remember: It is much better if I enjoy a fruit and alcohol product produced by experts! But, I could have one of my future characters own and operate a winery...Yes, that is a much better idea! Here are the wines we chose. I loved your "five things about fruit and alcohol"...although I did have to follow the link for yukaflux. That word even SOUNDS like a bad idea, LOL!